Proud dad Dean McDermott won't let body-shamers and "haters" have the last word when it comes to his children. Tori Spelling shared a sweet shot of her family alongside her "Beverly Hills, 90210" pal, Ian Ziering, and his own wife and kids on Instagram Thursday. But what started out as an innocent update about their broods and a big night out turned into anything but family fun in the comments section. 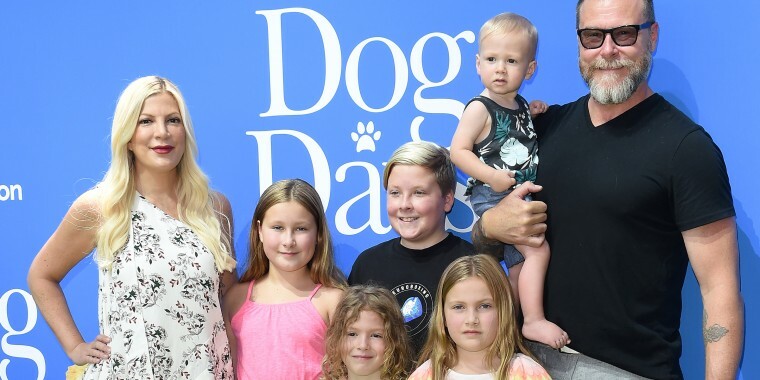 Spelling's caption focused both on the "kiddos" and the good time they all had together at the Los Angeles premiere of the movie "A Dogs Way Home." However, that wasn't the focus of many of the replies she received. Instead, there were a variety of cruel comments about the five children she shares with husband Dean McDermott — Liam, 11, Stella, 10, Hattie, 7, Finn, 6, and Beau, 1. Followers criticized the kids for a number of so-called faults, including having "greasy hair and wrinkled clothes," looking "chubby," "terrible," "cheap," "shabby," "unhealthy" and far worse. But McDermott wasn't willing to just silently scroll past the trolls. "I am absolutely horrified and disgusted by the comments being left about my children," he wrote in a reply of his own. "Body shaming and bullying my children??!! What is wrong with you people??!!" From there he launched into a lengthy defense of just a few of the points that were raised. "For your information, we went from a long day at school to the movie," he explained. "And I don't know any child that is NOT disheveled at the end of the day. Not to mention that just before this picture was taken, they were wrestling and running around with all the other kids that were at the movie. So I apologize we didn't get the iron and steamer out to make them perfect for you. (They're) kids. They're messy and dirty. That's what they do." There were even snarky remarks about the fact that the children appeared to be dressed in basics from Target. To that, he continued, "And what's wrong with shopping at Target??!! Over half of America shops there. The way they grow out of clothing so quickly is astounding. Are we supposed to shop at Gucci?? These are kids folks. Messy stinky little bundles of fun, laughter and love." And for the fat-shamers in particular, he reserved some of his harshest remarks. "As far as saying my children are overweight, well, that's just mean and uncalled for," McDermott wrote. "They're going through different growth phases, and even if our children are on the bigger side, who cares? They're happy and healthy and I'm sorry they don't look like skinny supermodels. People come in all shapes and sizes. So who are you to judge? You should all be ashamed of yourselves for passing such horrible judgement on innocent beautiful children. Shame on you all!!!!!" But the proud dad also had words of kindness for those commenters who left uplifting messages. "Thank you to all the people who came to our defense," he added. "You're all kind compassionate souls. Down with the haters!! Up with love!!" This isn't the first time the family has faced this sort of problem on social media. In September, Spelling shared a pic featuring four of her kids as they set out for the first day of school, and similarly cruel comments followed. "I am a proud mama bear and I enjoy sharing our family journey with my family, friends, fans, and online supportive and loyal community," she wrote in response. "And thank you to all the #mamabears out there. We always have each other’s backs! For all the individuals on here that felt the need to #momshame and #kidshame me and my children I say, 'Shame on you!'"